The National Operations Center of Excellence named the North Carolina Department of Transportation as the overall winner of its first annual Transportation Systems Management and Operations awards competition on Jan. 13 at the 2019 Transportation Research Board annual meeting in Washington, D.C.; beating three other finalists to take home the TSMO trophy. The organization also named Ali Zaghari, deputy district director of operations for District 7 within the California Department of Transportation, as its 2019 TSMO Champion. The North Carolina DOT won the award for using “creative” TSMO strategies that helped it safely evacuate more than a million people in advance of Hurricane Florence in September last year, while enabling the agency to continue providing critical, public communications detailing road closures and collapses long after the storm passed. “Day in and day out, we work hard to keep traffic moving and people safe. Hurricane Florence showcased our relationships with other public agencies, the private sector, and the emergency responder community,” noted Jennifer Portanova, North Carolina DOT’s state systems operations engineer who traveled to Washington D.C. to accept the award. Son added that the quality of competition’s 60 overall submissions, from which four finalists – including the eventual overall winner, North Carolina DOT – were drawn highlights the growing understanding and influence of TSMO as a saver of lives, time, and money. 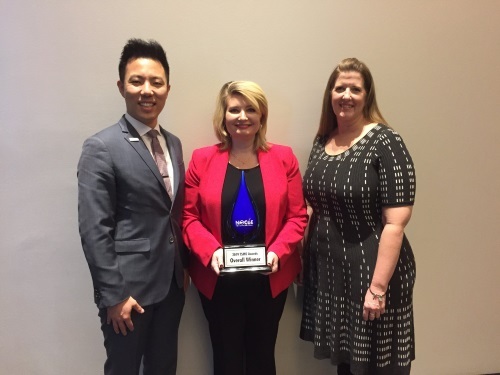 Caltrans’ Zaghari won the NOCoE TSMO Champion award in part for leading a four-year effort to develop and implement a statewide initiative to reorganize the agency’s traffic operations program towards a focused corridor management or CM strategy. The first of its kind in the nation, this CM strategy brings together internal and external collaborations, system monitoring, performance evaluation and planning for operations – all based on TSMO principles. The NOCoE noted that, under Zaghari’s leadership in 2017, Caltrans District 7 traffic operations division finished a complete restructuring to align with the principles and techniques of TSMO, all while shifting its operational practices over to the CM strategy. The group added that Zaghari also helped design and deliver the first connected corridors pilot in California on Interstate 210; an effort geared to enhance safety and system performance development through multi-jurisdictional collaboration and management of the corridor.